Even if you're not expecting, the process of knitting a baby blanket for someone special is an entirely personal and emotional process. The excitement of welcoming a tiny someone into the world, the hopefulness of what his or her life will become, and the joy of adding to a loved one's family are just some of the emotions that can run through someone's head while knitting a baby blanket. If you've always wanted to learn how to knit a baby blanket but weren't sure where to start, peruse this list of darling baby blanket knitting patterns. From stashbusting ideas to intricate lace designs, there's a pattern in here for every expecting mother, aunt, grandmother, and friend. Looking for even more adorable knit baby patterns? 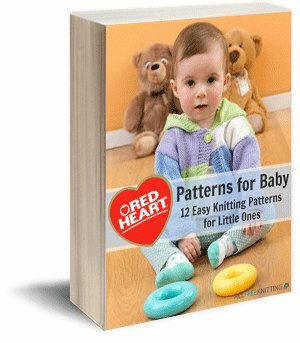 Check out our popular free eBook, Red Heart Patterns for Baby: 12 Easy Knitting Patterns for Little Ones! One of the best things about stashbuster baby blanket knitting patterns (besides the fact that they magically clear out your yarn bin) is that they are a unique way to add a homey touch to your baby's nursery. Depending on what type of yarn you have on hand, a stashbuster baby blanket can look different every time you decide to knit one. Stasbuster baby blankets offer a great opportunity for creativity and ideas you wouldn't normally try. The next time your yarn bin starts to look a little overgrown, grab a pair of knitting needles and whip up one of these unique, stashbuster baby blanket knitting patterns. Lace adds sweetness and serenity to any baby's nursery. Lace baby blanket knitting patterns are both soothing and classic, making them family heirlooms that multiple generations will cherish for years to come. Whether it's a small, looping border of lace or an entire blanket full of intricate stitches, any one of these lace baby blankets is sure to add a delicate and timeless touch to your baby's room. With a little patience and a lot of love, you can create one of these lovely lace baby blankets for your own bundle of joy. One of the best things about baby blanket knitting patterns is that they are like one giant stitch swatch. Because of their simple shape, there is a ton of room to practice a certain stitch and to gain confidence with a particular pattern. Even if you're not sure of your knitting skills, don't let a baby blanket knitting pattern scare you away. Knitting a baby blanket is an important process all expecting mothers should consider trying. Any one of these easy baby blanket knitting patterns is the perfect starting point for beginning knitters (and expecting mothers!). For more adorable baby blankets like this one, take a look at our 301 Too Cute to Handle Baby Knitting Patterns! Whether you're knitting for your first child or your fifth, you want the blanket you knit to be a special symbol of your love for them. If you're ready to take your knitting to the next level, check out any one of these intermediate baby blanket knitting patterns. With a little patience, you can create a beautiful knit blanket full of intricate stitches and impressive designs. The finished product will be one you and your baby will cherish for years to come. I can't find the pattern for the blanket on the cover "How to knit a baby blanket"